A few sonar artists got together to celebrate Sonar Records 25th Anniversary, on November 4th 2009 at the Spencer Sports Club in Earlsdon Coventry and the subsequent release of the Sonar 25th Anniversary Album. A bit about the bands on the album……. The indisputable mover and shaker of the Coventry music scene in the 80’s, multifaceted musical chameleon Dave Pepper gave us fresh new wave tunes in the 1978 band ‘The X-Certs’, and went on to grow the tallest Mohican within the city boundaries with ‘Blitzkrieg Zone’. Dave flirted with several musical styles, one of which was the new romanticism of ‘Courtiers of Fashion’. This is a very rare recording originally released in 1983 and the first release on Sonar Records and his only visit to Cabin Studio. This self named track, penned by Dave, features Dave – Vocals, Keyboards, Guitar, Paul Johnston – Drums, Keyboards and Karen Ellett – Vocals. The Pep moved over to the USA for a while but is now based in Spain. Together with ‘The discussion’ this track ‘Courtiers of Fashion’ is also available in it’s original form as a 45 rpm vinyl single. Armalite were formed by singer/songwriter and multi instrumentalist Cary Lord who started life as a bass player for Coventry band L’Home de Terre in 1980. Over several years this band experienced several line up changes including Toby Lyons (colourfield) ex swinging cats drummer Billy Gough, ex clique singer Caren Joyce, targets guitarist Adrian Dix, and ex Wild Boy – Johnny Thompson. They were runners up in a battle of the bands at the Lanchester in 1981, and eventually Armalite came together in 1984. Paul Johnston – drums, Cary Lord – Bass guitar/backing vox, Caron Joyce – Lead Vox, and Adrian Dix all guitars recorded this single at the 8 track Cabin studio. Produced by Armalite and Paul Sampson, ‘Living on the Edge’ b/w ‘Breakaway’ was written by the band and was the third release on the sonar record label sporting the catalogue number SON 3. Available to download and as a 45 rpm vinyl single. After ‘She’s the leader’ split, bass player Cary went on to join several pro touring bands, and has been writing and recording under the name of `BLUSH’ ever since. The album ‘Independence Day’, was released in 2006 on the Sonar record label and has released several more albums since then. Her last ‘Looking Back Looking On’ was released in 2016. Crokodile Tears are an electro/rock/psychedelic folk duo from Coventry. They released their debut self titled album on Dodgy Ticket records, a subsidiary of Sonar Records, in 1985. Now available on 33 rpm vinyl featuring gems such as Bouncing Boy, Exploding Men! and Great White Yonder, ‘Crokodile Tears’ enlisted the help of several of Coventry’s finest musicians including bass player Barry Jones, Drummer Robin Hill, Steve Edgeson on Clarinet, Steve Young on percussion and Drums, Paul Sampson on Guitars, engineering and production duties and Christopher Sidwell who writes and arranges the music for a band who regard themselves ‘as English as tea’. Recent album ‘Gulibles Travels’ features the track ‘My Favourite Weather-girl’ about Central T. V.’s Charlie Neil is championed by the lady herself and is featured on several fan sites as well as Central T. V.’s. Many of singer/guitarist Christopher Sidwell’s songs are observational and are based on his life growing up in Coventry. ‘Cathedral Lanes’ is about him being ‘dumped’ in the city-centre shopping arcade of that name. Multi-instrumentalist Alf Hardy has produced and played on albums with Spacemen 3’s Sonic Boom. The duo have recorded with fellow Coventry musicians the Ripps, guitarist/producer Paul Sampson, former Hawkwind guitarist Jerry Richards, ex-Tubilah Dog Banni & Coventry’s very own ‘Ringo’, Robin Hill on drums. As well as the tracks featured on ‘Sonar Music…’ the album ‘Going for the Jugular’ is also available for download. Freddie – Vocals/guitar, Steve hands – drums/vox, and Rob fellows – bass/vox created laughing HOUSE. Crafting the Coventry sound, Laughing HOUSE, incorporate trademarks of the Clash, occasional touches of Killing Joke and the vaguest bow towards U2 in some of the guitar lines. The lads play aggressive well-structured songs punctuated with rhythmic stops and kick-starts and raw punch, with rich harmonies. The ‘Democracy’ EP features 4 tracks – Wasted, Take the mask away, Decline and fall, and Walking on my own all written by the band, and produced by laughing HOUSE and Paul Sampson in 1987 and now available for download as well as in original 12” 33 rpm vinyl format. Chris Aldridge AKA Beebe, is regarded as one of the UK and Europe’s finest saxophonists and possesses a wide ranging technique which ranges from beat boxing while playing flute, to playing two saxophones at the same time. Chris released his self titled debut album in 1997 throughout the Middle East and Europe. Reviews have compared his saxophone expertise to Grover Washington and earned him a prestigious endorsement from Keilwerth saxophones. He also performed on the soundtrack to the film Intimate With A Stranger which was premiered at Cannes Film Festival. Beebe was featured on the DJ Spoony show on Radio One for three days in October 2005, where he taught him saxophone live on air ready for a Craig David concert. He has recorded on albums with Bizarre Inc, Mother, The Christians and Gold Blade and performed on support tours with Rancid, Edwin Starr and Blue. He has also appeared at Reading Rock Festival, London Jazz Festival and Montreux Jazz Festival. Beebe’s wide-ranging abilities have taken him on tours with US3, Geno Washington, Jaki Graham as well as appearances with UK, American and Asian jazz icons such as Gerard Presencer, John Dankworth, Victor Mendoza and Surinder Sandhu. In addition to having airplay on Jazz FM and the Paul Jones blues show, one of Beebe’s saxophone solos was included in the Montreux Jazz Festival compilation CD in 1999. He also plays with Alf Hardy in Earthlab and brings pure class to the album with his soaring sax and superb instrumental track ‘Liz’s Song’. His debut album ‘Chris Aldridge’ is available for download only. Coventry – Spring 1983. The furious apples vocalist Greg Crabb recruited Robin Hill (Pink Umbrellas) on drums, John Westacott (ex-Urge) on bass and (Raphael Moore) on guitar, along with Mike Crabb, and Abbe Collins on keyboards to record a single – Engineering b/w Belladonna, was released in October 1983. This was the second release on the Sonar record label. Paul Sampson engineered and produced. The apples were the first band managed by Wayne Morris, owner of the European Son T-Shirt shop in Gosford Street and a budding pop svengali. John Peel played the Apples single and some interest was shown by CBS. Greg is fondly remembered for being one of Coventry’s best looking rock stars, his scarves which used to drape his mic stands and the Coventry Evening Telegraph headline ; ‘Don’t you know who I am? 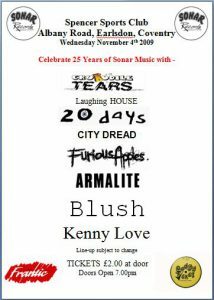 – I’m Greg Crabb!’ The apples have two rare tracks featured on the ‘Sonar Music – 25th Anniversary’ album ‘Engineering’ and ‘Belladonna’. As well as downloads, these tracks are also available on their original format 45 rpm vinyl. Another Paul Sampson production, 20 Days were one of Coventry’s great lost bands Originally a school boy band John O’Sullivan – vocals & guitar, Simon O’Grady – vocals & guitar, Peter Burke grew up together and developed into ’20 Days’ who have prolifically released excellent pop/rock music including this track ‘Freefall’ which features on the Sonar music album. 20 days self titled 12” EP featuring this track together with ‘Night–time’, ‘Heavens High’ and ‘Into the Open’ are available as a download OR as a 12” 33 rpm vinyl EP on vinyl. 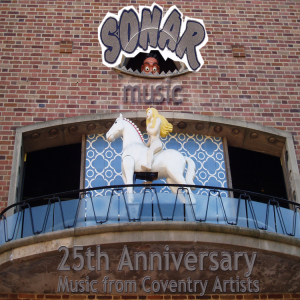 Sonar Music – 25th Anniversary available for download and streaming from itunes, amazon, spotify etc.